Brie and Camembert are bloomy rind cheeses characterized by their edible, downy white rinds. 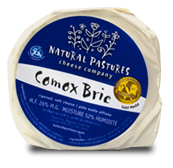 Our internationally recognized, gold medal Comox Brie has a buttery soft interior and a gentle, creamy flavour. Our Comox Brie & Comox Camembert are delicious served on their own or topped with chutney or tart jam. For optimal flavour, serve at room temperature. Get melt-in-your-mouth cheese when baked in oven at 325°F for 10 minutes. Lovely with baguettes, crackers, toast or in a grilled cheese (especially with fruity bread!). The perfect traditional classic for your cheese plate. Good with white or red wines. 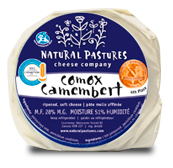 Our famous Comox Brie exemplifies the traditional, gentle flavour of a superb, bloomy rind cheese. Slight buttery taste and a delightful, creamy texture. What does the bloomy rind of Brie and Camembert tell you about the cheese? A rind can protect a cheese, promote ripening, augment flavour, and provide a visual and textural contrast to the paste. When expertly made, the bloomy rind should be thin and moist enough to appear smooth with no cracks. Often these rinds will smell of fresh mushrooms. The downy covering is created from the addition of a mould called penicillium candidum, which causes the cheese to ripen from outside in. 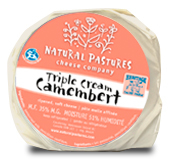 Our creamy, rich Camembert has a delicate note of mushroom and a tender bloomy rind. The rind should be fine and off-white rather than like thick white velvet, and the presence of some reddish-brown pigmentation indicates the cheese is nearly ripe. Too much pigmentation, especially around the edges, means it is on the downhill slope. The aroma should be mushroomy with a yeasty, almost meaty taste. A whiff of ammonia is acceptable; a strong, discernable smell of ammonia means that the cheese has gone too far. It should feel supple from edge to centre and should not feel runny or uneven. Indulge in a decadent, smooth, richer version of our award winner. A creamy finish complements the delicate note of mushroom. Seasonal only. Watch for it in stores every Fall. According to Cynthia Gold, a tea sommelier in Boston, soft, mild, creamy cheeses pair well with bright and crisp black teas. Look for an astringent first flush Darjeeling or a clean, fresh green tea such as Japanese sencha. 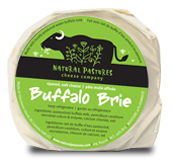 An exotic twist on our world champion Comox Brie, our new Buffalo Brie is the very essence of traditional and inspired cheesemaking. Rich water buffalo milk from the Island transforms this cheese’s texture and allows your taste buds to explore new pathways. Water buffalo milk is so rare in these parts that we had to wait until two more water buffalo dairies opened (for a grand total of three) to expand our line of water buffalo products. At one of these new dairies, McClintock’s Farm in the Comox Valley, all of the 15 new calves one spring had names that started with ‘A,’ like Annie. You can read more about McClintock’s Farm in this article from InFocus Magazine (June/July 2013).